* From Milwaukee - Drive north on I-43 thru Milwaukee, I-43 splits off at Port Washington, go north on Hwy 57 to Hwy W. Turn left on Hwy W and take it to the left to Hwy F. Turn left on Hwy F and watch for the Dundee and Long Lake State park signs. * From Milwaukee - Drive north on Hwy 41 until it splits off to north Hwy 45. 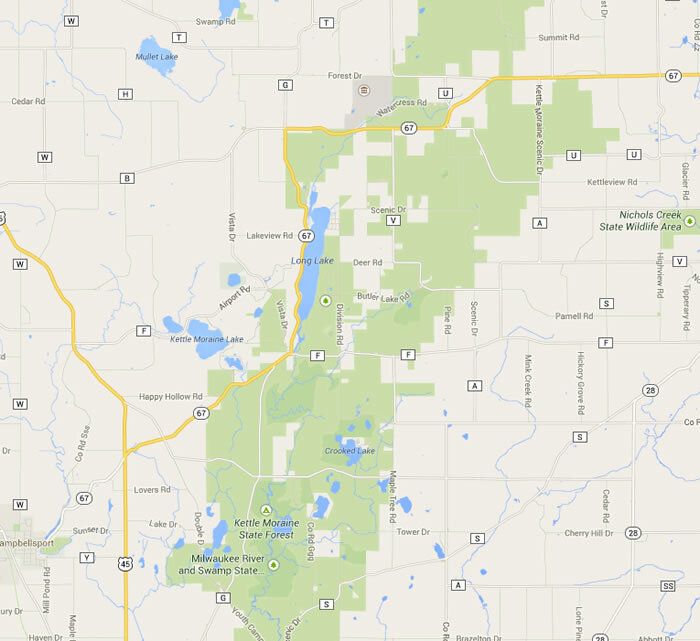 Take Hwy 45 into Kewaskum and continue through Kewaskum to Hwy 67. Turn right on Hwy 67 and watch for the Dundee and Long Lake State park signs. * From Fond Du Lac - Drive south on Hwy 41 to Hwy B. Turn left on Hwy B and take it into Eden. Once in Eden Hwy B will end and then continue on Hwy 45 south. Take Hwy 45 south to Waucousta where you will turn left on Hwy F. Take Hwy F into Dundee. Google Maps - Click Here.